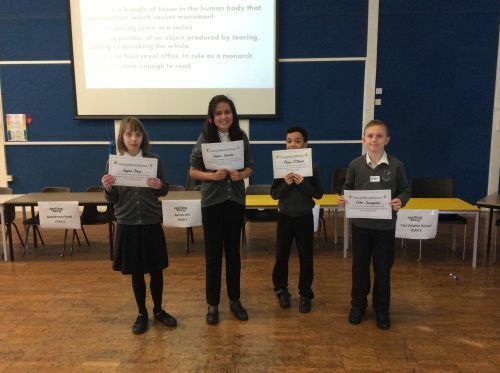 Four children from Years 5 and 6 at The Kingfisher School took part in the Venturers Trust Spelling Bee today. Kindly hosted by Merchants' Primary School, the event was a great success! Our children didn't enjoy the same success as last year, as joint first winners, but still had a fantastic time! Kaylah said that her favourite round was the "missing vowels" round. Isaura thought that it was a harder competition than last year. Rhylan's favourite round was the general spellings and Oskar said that "it was fun but challenging". We are so very proud that our children represented our school today. We would like to congratulate the winners of the competition, The Dolphin School. Our children are already looking forward to next year's event!